This week saw the 40th anniversary of the fall of Saigon and the end of the Vietnam War. Four decades later, how do young Vietnamese view the Vietnam War ? For an American perspective, a group of Marines who’d been left behind after the Ambassador was evacuated returned to Saigon to recount  how they experienced the final moments of the conflict. Meanwhile, TIME features 21 iconic photos  of the Vietnam War (but warning, some of the images are graphic in nature). Also this week, Japanese Prime Minister Shinzo Abe made an historic speech to a Joint Meeting of Congress in Washington DC (full text here or video here ). In the speech, Abe spelled out the reasons for strengthening the alliance, but in maintaining the position of previous governments, he didn’t deliver a fresh apology for Japan’s actions during the Pacific War as many had expected. For more on Abe’s messsages, read  Michael Green and Nicholas Szechenyi on cogitASIA. There’s been a shake-up within the Saudi Arabian royal family with a younger generation of princes given more influence earlier this week which, as the New Yorker‘s Robin Wright sees it, could ‘shape policy in the world’s largest oil exporter for decades’. Read more about the transition and its potential impact here . For a quick snapshot of Australia’s trade and security relations with the US, I recommend a new resource  jointly produced by the East-West Center, United States Studies Centre and Perth USAsia Centre on why Australia matters for American and vice versa. Along with handy graphs and maps, the publication also provides useful statistics on the volume of Australian arms imports supplied by the US. How can the US military maintain technological edge? Rather than developing multiple offset strategies, invest in a hedging strategy and in your institutional capacity to adapt, recommend Ben FitzGerald and Scott Cheney-Peters. For more on how this works and why it’s needed, keep reading their War On The Rocks piece here . Despite an official ban on women in ground-combat units, American women continued to serve alongside US Army Special Forces in Afghanistan in Cultural Support Teams, aimed at accessing and communicating with Afghan women. 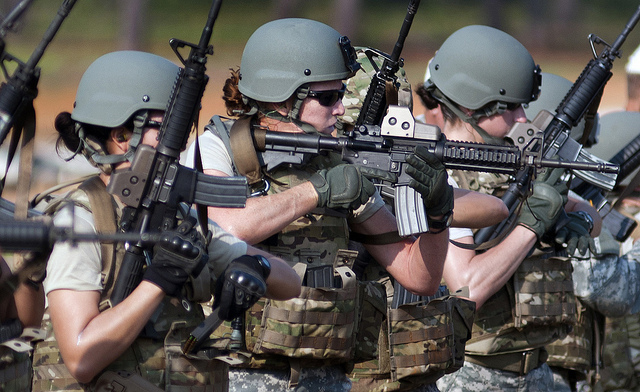 Back in 2012, I wrote that there was still a dearth of information about CSTs, but in 2015, Gayle Tzemach Lemmon’s new book Ashley’s War  explores the bonds between women on the battlefield and the story of 1st Lieutenant Ashley White, the first CST killed in action. Check out NPR’s interview with Lemmon here  and book review by Brian Castner on Foreign Policy here . Lastly, the Duffel Blog has obtained exclusive footage of ISIS training techniques . Interested in Chinese foreign policy? Stapleton Roy, David M. Lampton and Robert Daly come together at an East-West Center event to talk China’s regional policy, foreign policy and relations with the US  (1hr 19mins). Strategy wonks will appreciate Lawrence Freedman’s recent appearance in this War On the Rocks podcast in which Ryan Evans asks him about the Middle East, Russia, China and Britain’s role in the world (19mins). For more about Australia’s intel deal with Iran, check out my new CIMSEC podcast  featuring ASPI’s Andrew Davies on the challenges such a deal poses and whether (intelligence) sharing really is caring (10mins). Blog post version here . Natalie Sambhi is an analyst at ASPI and managing editor of The Strategist. Image courtesy of Flickr user U.S. Army John F. Kennedy Special Warfare Center and School.